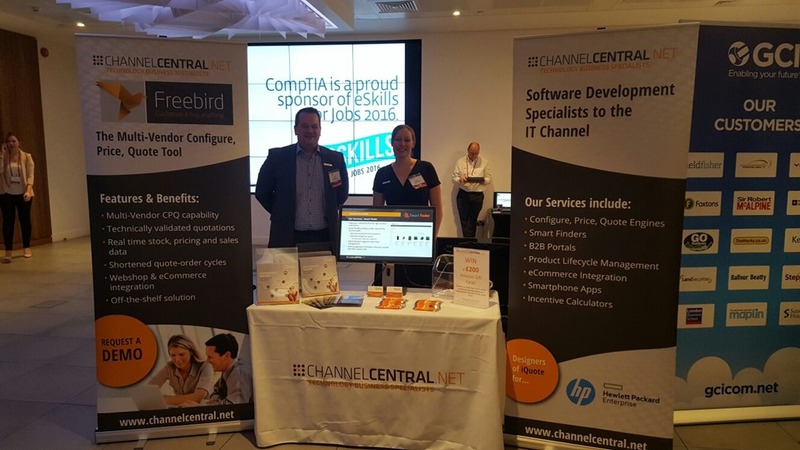 As a Premier Member of CompTIA, channelcentral was invited to attend our first EMEACON this year in London. The event was held in a great venue and attended by over 400 IT Channel professionals from a host a Managed Service Providers, Vendors and Resellers. The event is a mix of certification sessions for those looking to build their CPD hours and IT Channel sessions for the wider community and is very well planned out. On Tuesday the event kicked off and we were fortunate enough to attend a lively session by the author Charlie Hutton, who gave some fantastic insight to Online Lead Conversion in his session “How to ‘Legally Murder’ your Competitors Online”. There were also a number of other useful workshops led by different thought leaders. Also on Tuesday we heard from Tracy Pound, Managing Director of MaximITy who introduced a fantastic initiative to introduce more women into the world of IT. The #MakeTechHerStory campaign was launched and led many of the Professionals in the room to ‘let their hair down’ momentarily by finding innovative ways to wear the campaign bandana! A great Day 1 was wrapped up with a drinks reception and fantastic Networking Dinner which was enjoyed by all. Day 2 saw the main foyer full of exhibitors who had an incredibly early start to set-up stands to promote their solutions to the rest of the delegates. channelcentral was fortunate to have a great stand position and be given the opportunity to promote its Configure, Price, Quote (CPQ) Software and other services. It was a busy day with lots of insightful conversations taking place around the event, including more sessions for the Certification Partners and IT Channel that had a chance to expand their knowledge on Cybersecurity, the Internet of Things and the general state of the industry. Thank you to CompTIA for a great couple of days of Networking. It was a good opportunity for channelcentral to meet new customers and build Channel relationships. The hospitality was superb and we look forward to joining CompTIA at many more events in the future! channelcentral is delighted to announce that it is now a Premier Member of CompTIA. CompTIA is the IT Industry Trade Association. They are best known for their IT Certifications and education programmes but also provide industry resources, run communities and offer vast networking opportunities for IT Industry organisations. As members you can expect to see us at some forthcoming CompTIA events and participating in community discussions. We will also have access to industry research and resources which we can share with our partners. We look forward to meeting fellow CompTIA Members in the near future to both learn from and impart our own industry knowledge.